Having now embraced the wacky world of Dr. Horrible and co. (and with plans to make my own Captain Tight-Pants Hammer fan t-shirts), I find myself befuddled over one thing - where has the adorable Neil Patrick Harris been all my life? Oh, starring in a sitcom, you say? Hmm, will have to look into that. During the rather traumatic Writers Strike of 2007-08, writer/director/god Joss Whedon worked double duty at the picket line and on the guerrilla filmmaking front, investing his creative time, energy, and cash in a low-budget musical web series. He believed the best way to stick it to The Man was to model independent Internet distribution to prove to studio executives that web series could be successful and that the talent involved deserved their fair share of the revenue. Dr. Horrible's Sing-Along Blog is a true team-effort combining the talents of a whole brood of Whedons (Joss, brothers Jeb and Zack, and future Whedon-by-marriage Maurissa Tanharoen), as well as Whedon alumni Nathan Fillion (Buffy, Firefly/Serenity), Felicia Day (Buffy), and alumn-via-association, the aforementioned Neil Patrick Harris. 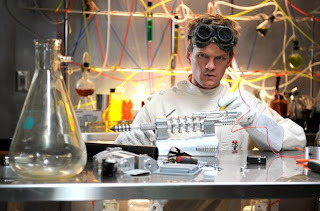 Dr. Horrible (Harris) is a wannabe master villain who maintains a web blog through which he shares his villainous deeds with his Internet fan base. When not working to perfect his Freeze-ray device to guarantee him a position in Bad Horse's Evil League of Evil, Dr. Horrible is fending off his archnemesis, smarmy Captain Hammer (Fillion), while trying to win the heart of doe-eyed, frozen-yogurt-loving Penny (Day). The entire cast sings their way through three acts of witty banter, thrilling budgeted action sequences, and blossoming love, wrapping up the 44 minutes in true Whedon-fashion - for better or worse. The buzz is that in addition to a soon-to-be-available soundtrack and DVD, there is a sequel in the works, and possibly even a theatrical production (but only if the Powers That Be cut Whedon a break for once). At the very least, fans are hoping that while sing-alongs of Once More With Feeling were stricken from theaters last year, Dr. Horrible may break free of the computer screen to make it to big, midnight screens across the country. Screens with curtains. Lacy, gently wafting curtains.